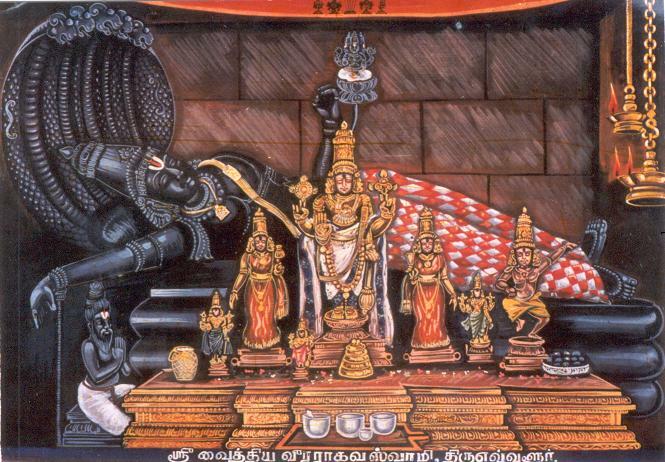 The presiding deity Veera raghava perumal is in a reclining position facing east, and the goddess is Kanakavalli taayaar, enshrined in a separate sanctum. The perumaal right hand is kept on the head of Saalihothira muni. Narada muni, Brahma is shown the Paramathma Swaroopam (one way of the showing his body or seva) and showing the Gnana Muthirai in his left hand as the symbol of Vedas. This is the way the Moolavar is gives the seva to the world. The deity is in a lying position on a stage of 15.5 feet height. There are also shrines for Lakshmi Narasimhar and Chakarathalwar in this temple. The Perumal here is Veeraraghava Perumal and he is capable of curing diseases so he is called "Vaithiya Veeraraghavan". Sage Salihotra came to this is Veeksharanya Kshetram and performed penance for one year near the tank in the temple. He came to the Kshetram on Thai Amaavasai. On the same day he came, he took bath in Hiruthaapanasana Theertham and on the north shore of this theertha, he started the silence fasting (mouna viratham) for one year. As he was fasting for one year without food or drink, he collected on that day some paddy and prepared prasadam out of that. After completing the pujas in the month of Thai, in the evening, he prepared some food, offered it to the Lord and waited for some one (Adhithi) to come, so that he can offer them something to eat and after that, he can finish the fasting. An old man appeared before him and asked him some food. The sage gladly offered a share but it was not enough for him. The sage gave the whole quantity to him gladly. The guest was satisfied and - left the place. Salihotran commenced another year's penance without food and drink. After finishing his morning rituals, he procured some paddy and prepared oblations. Like the previous year, he offered a portion to Lord Narayana and was waiting for a guest to offer the second portion, leaving the last portion for him. This time also the old Brahmin was coming by that way. Salihotran-welcomed him and while accompanying him to the hermitage, the old Brahmin expressed that he was feeling extremely hungry and thirsty and needed a place for rest also. In the hermitage, Salihotran offered the entire prasadam meant for the guest as well as for himself. After taking the food completely, the old guest wanted to go for a sleep and he asked where can he sleep? (Evvullil Urangalam) (Vul - means a place). For this, Salihothirar asked him that he can sleep in his hut itself and he will do the Paadha seva to him. The old man slept keeping his head along the south direction. The sage found that the old man was none other than the Lord Vishnu himself. The Lord asked what the sage wanted. The sage sought a boon that the Lord should not leave the place and grace the devotees fulfilling their desires. The Lord obliged and the temple of Veeraghavaswami came up in Tiruvallur. Since he asked Salihothirar muni that in which place (Vul) he can take rest, this sthalam is called "Evvulor" or "Thiru Evvuloor". The temple was built during the Pallavas period. This temple is under the administration of the Ahobila Mutt. It is an east facing temple with a 5 tiered rajagopuram. There are also shrines to Ganesha, Gopalan, Nammalwar, Vedanta Desikar, Aandaal, Ramanujacharyar, Lakshmi Narasimha. There are inscriptions dating back to the 2nd half of the 9th century Pallava period here. The water in the tank is considered more sacred than that of Ganga. A dip in the tank relieves the devotee even from sins he committed by mind though not in action. It is believed that bathing in the temple tank, and worshipping Veeraraghava perumaal with symbolic offerings of salt and pepper here, is a cure to many a physical ailment, and hence the deity is also known as Vaidya Veeraraghava Perumal. It is also believed that barren couples beget progeny upon worshipping here. It is a marvelous sight to see the glorious specimens of Dravidian art in sculptures depicting the mythological legends of Hindu scriptures in the pinnacles of the gopurams. The Lord's abhishekam is performed only with sandalwood oil. Abishek to Lord is performed with perfumed oil only. Salt and pepper offered to the god is believed to cure diseases and restore good health to the devotee. Small metal form of parts of body and other symbols are available in the nearby shops and these are put in the hundi by devotees for curing particular disease. The temple tank, Hrittaapanasin, is of great importance as s it here that people who are unwell dissolve jaggery and pray to the Lord for a cure. They also throw salt and pepper into the tank theres a legend attached to this tank. Lord Veera Raghava Perumal is all merciful a physician. Any sick person praying here continuously on three new moon days is cured of diseases as stomach pain, defects in hands and legs and fever. Devotees also pray for child boon and happy wedding and reliefs from any untold hardship and suffering. The temple is open from 05:00 a.m. to 12:00 noon and from 04:00 p.m. to 09:00 p.m.
Tiruvallur (station code: TRL) is on the Chennai- Arrakonam rail route and is 42 km from Chennai by rail. One can approach this place by public bus or train from Chennai. Sri Vaidiya Veera Raghavar Temple is situated 2 kms away from the Railway station and half kms away from Bus stand. Share autos are the common mode of transport to the temple, although Public transport buses are also there.